Stories are important. We live in a world that is increasingly more and more technological, more and more saturated with snippets of information and media, rallying together into an incoherent mess, a hodge-podge of factoids and opinions, double-speak, and ironic distance. Where does this ‘stuff’ come from? Why is it here? It is as if we’ve come full circle to the basic meaning of existence that hinges on the simple premise that a good story is a good story regardless of time and space. The endless hours of commentary on just about any topic available on YouTube alone, seems to point to another basic premise, and that is that we do care about where all this stuff comes from. But this review of “Towers & Walls: New Works by Sally England and China Adams” at the Porch Gallery isn’t about the above… ok, maybe a little. When I see a show or a work of art, my first go to is, what is this about? What is the story and the meaning? It’s basic, but that is how my mind works. A work of art isn’t there just to look pretty on a wall, though there is absolutely nothing wrong with that. What hit me when I walked in the door of Porch, is how nicely understated the art is. It looks like it belongs in the space and forces one to really look. The color scheme is black and white, mostly white, the gallery is mostly white, with accents of black and natural wood. Subtlety as a strength. “Towers and Walls” doesn’t beat you over the head with its narrative, which seems like it ought to be heavy given the circumstances. 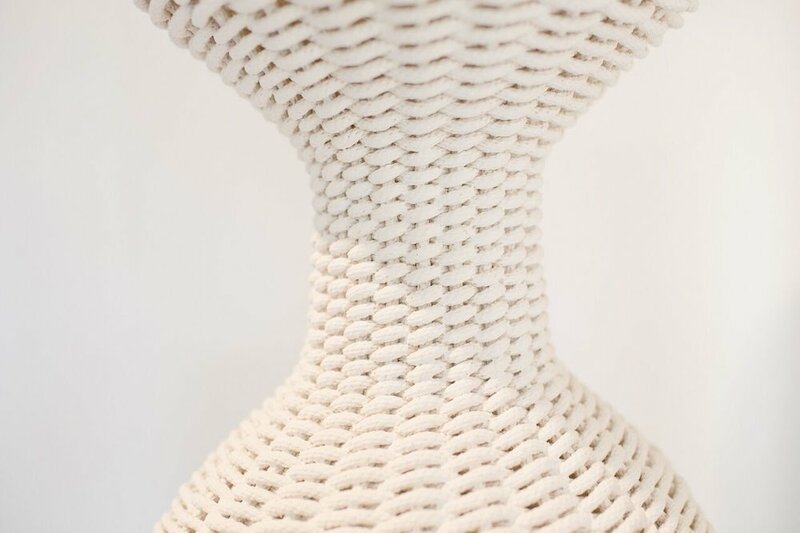 Sally England’s water towers made from cotton rope hang like effigies in the gallery space. They reference England’s childhood memories of water towers in the Midwest, the architectural/conceptual photography of Bernd and Hilla Becher and the woven sculptures of Ruth Asawa. In the Midwest water is plentiful, or so it would seem. Here in Southern California, water is a precious resource and the management of water boils down to concepts—political and existential. There is something poetic about the material use of rope made from cotton, a plant fiber that requires boundless amounts of water in irrigation to grow, to then weave a water tower out of it, even if it is to serve the memory of the thing itself. Playing counterpart to England’s tower effigies are China Adams’ ink drawings of rocks she encountered while in residency at Joshua Tree. Anyone that’s ever been to Joshua Tree National Park will immediately recognize the formations of weathered stone piles that look like they’ve been brought there by alien giants in some long-forgotten distant past for some unknown and mystical purpose. They’re so strange and beautiful that one cannot unsee them. Their image endures in memory. Adams’ simplified the rock forms to outlines and contour-like circular patterns, in some drawings recalling fingerprints and body parts like breasts and arms, and in others flattened moonrocks, the style and feel of a Ralph Steadman drawing without the influence of LSD. I can almost hear the coyotes howling at the moon in the middle of the night. “Towers & Walls: New Works by Sally England and China Adams” is on exhibit Oct. 4 to Nov. 4, 2018 at Porch Gallery Ojai, 310 E Matilija Ave., Ojai.